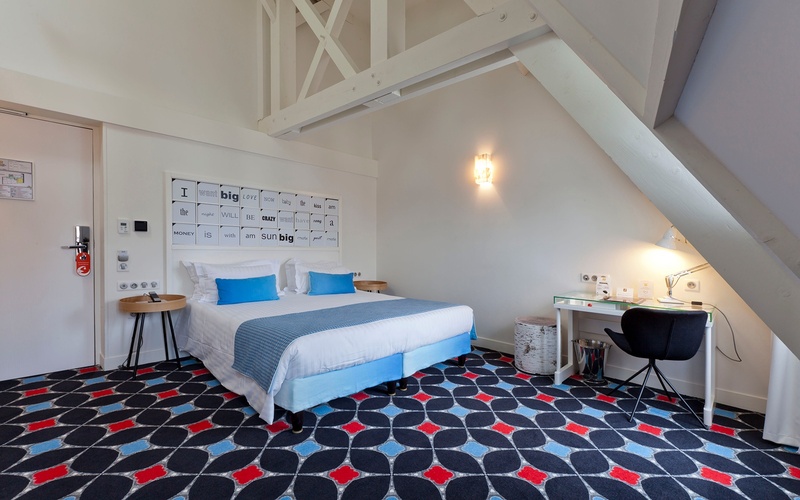 Located closely to the famous Pigalle red-light district in Paris, Hôtel Joke welcomes you in a beautiful building dated back to 1850 with a façade framing small glass cases containing stuffed animals and a toy robot partly illuminated by balloon-shaped lamps. Shrouded in candy colours, nostalgic school references, optical illusions and interactive toys hotel visitors are more than welcome to relive the French childhood they never had. 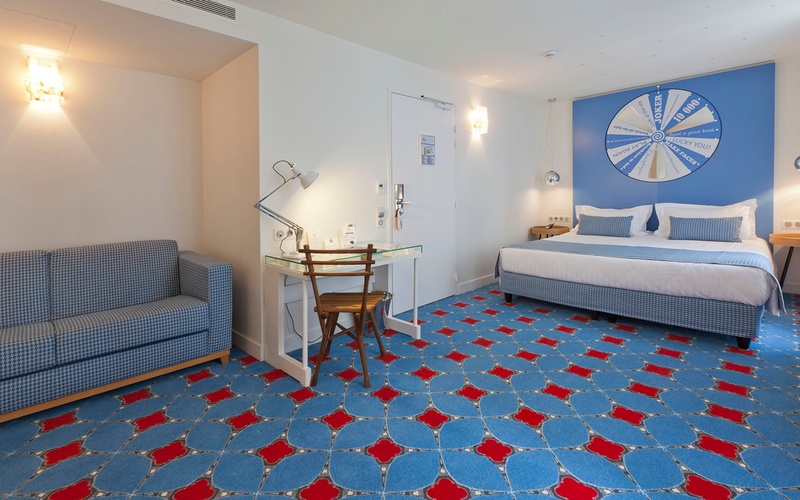 Lots of gimmicks and fun moments are designed into the hotel interior – from the 2 euros embedded in one of the tiles in the lobby’s floor over book cases with mirror effects and spinning wheels above the bed encouraging visitors to “Read a good book” or to enjoy “Breakfast in bed” or, if lucky even “Champagne”. The interior is completed by carpet designs using graphic codes for instance inspired from board games and the flip side of playing cards. The vaguely checkerboard pattern of the bedroom carpet is composed of small Eiffel Towers placed tip to tip creating a very interesting graphic effect. In the corridors, the same black and white geometric pattern decorating both wallpaper and carpet creates a fun house atmosphere spellbinding the visitor when heading towards the room. Hôtel Joke could be a cliché or as suggested by the name even a joke – but it is not. In fact, it is a thorough experience ensuring both the visitor and Hôtel Joke to have the last laugh.